From March to December of 2014, I was the Coordinator for the Audiovisual Artifact Atlas. The AVAA (or “Atlas” if I’m feeling affectionate) is an online resource for identifying and diagnosing artifacts and errors you might encounter when reviewing or digitizing analog video and audio. The Bay Area Video Coalition, located in San Francisco, currently hosts the site. As a technical resource, the AVAA is unique in its structure: developed as a wiki, it is an inherently community-based resource, which users can edit and contribute. Video and audio artifacts are often hard to define, and even harder to diagnose. Errors can be recorded into the original content or introduced anywhere in the digitization workflow. Another difficulty is that separate fields use different terms and descriptions for the same errors. AVAA developers and contributors at BAVC and Stanford University wanted to strengthen the work being done with audiovisual reformatting by providing a resource with examples, a common vocabulary, causes and descriptions, as well as troubleshooting guidance wherever possible. Determining if the error is correctable or if it is recorded in, and therefore permanent, helps us preserve the best quality possible. Practitioners in any field that incorporates a/v reformatting—including librarians, archivists, conservators, curators, and service providers—benefit from using, sharing, and contributing to the AVAA. In 2013, the National Endowment for Humanities awarded BAVC a grant to develop their project Quality Control Tools for Video Preservation. The project focused on a suite of open-source software tools (QCTools) designed to provide efficient analysis of digitized video content. (More information about QCTools is available here and the regularly updated software is available on GitHub.) Included in the grant was a position for an AVAA Coordinator to popularize the resource and help expand the analog video portion of the site. There are just too many controllable and uncontrollable variables to accurately predict the life of any given videotape. Of equal, if not more, concern is the limited availability of playback equipment and technical expertise over time. With this in mind, more and more audiovisual stewards are digitizing their videotapes, either in house or with a service provider. In both cases, the archivist (or librarian, conservator etc.) responsible for the longevity of the collection is also responsible for ensuring the quality and accuracy of the digitized content. The AVAA and the QCTools software are designed to help people discover any artifacts and determine if the tape needs to be digitized again. This position was one of my first jobs after graduating from a moving image archiving program, one which takes a holistic approach to the field of audiovisual archiving, However, I consistently found myself drawn to the technical side of video preservation, so I was already familiar with the Atlas and its usefulness as an educational resource. Most terms, examples, and definitions are provided by experienced technicians, many with decades of experience to cull from. 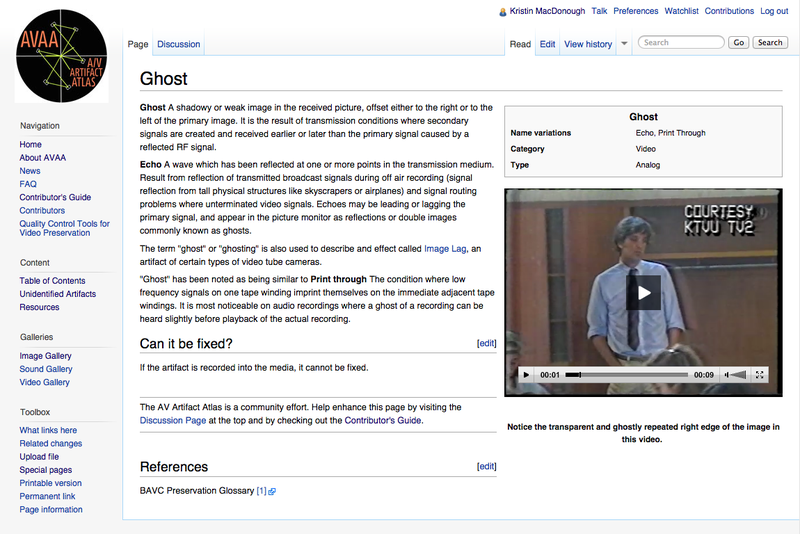 Some video artifact terms are pulled from other available resources, notably BAVC’s Preservation Glossary and the Compendium of Image Errors in Analogue Video. So how can you use this resource? If you’re looking at the site for the first time, you can start with the Table of Contents, which lists all of the audio and video errors on the site. 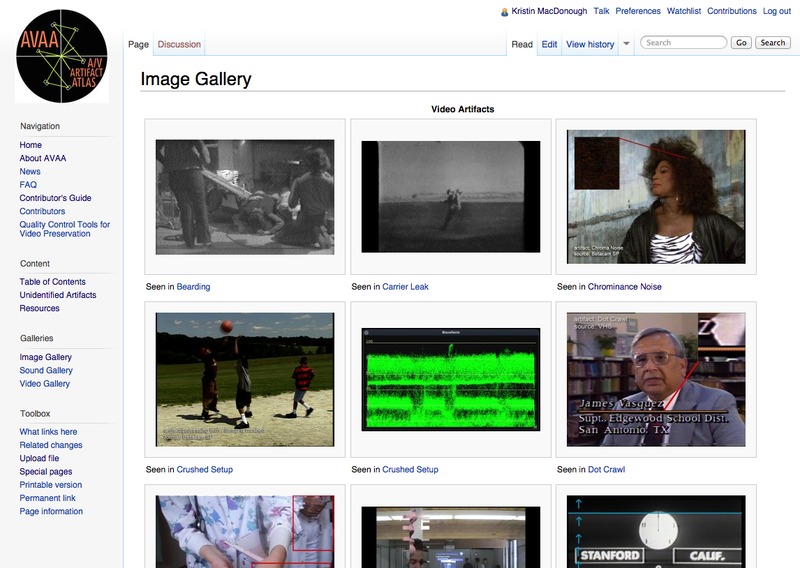 Other good pages to browse are the Image, Video, and Sound Galleries. The galleries provide a quick view of many examples on the artifact pages and are a great visual and audible index if you’re looking for something in particular but you’re not sure what to call it or how to describe it. On each artifact page, you’ll find a summary of the artifact, including a description of how it looks or sounds and possible causes. In the “Can it be fixed?” section, proposed remedies to the problem are provided. In some cases however, artifacts may be recorded in from the original production or introduced through a previous tape dubbing or reformatting. Nearly all of the artifact pages have video examples or screenshots. However some pages we are still trying to source some examples, so if you see such a gap and you think you might have material to fill it, please let me know! At my current position as a Digitization Specialist for a video collection, I use the Atlas to reference potential causes I encounter. In a recent case, I started to notice that certain tapes with minor skew problems (when a videotape stretches or shrinks, and the top of the image appears to angle to the left or right) had an occasional vertically shaky display and extreme skewing along the top of the image in some scenes. I determined the skew problem was recorded in and thus irreparable, and a review of the Video Gallery helped me determine it was a TBC (Time Base Corrector) processing error: the equipment was overcorrecting for the skew and introducing more errors. The AVAA strengthens the audiovisual preservation field as an easily accessible reference. If you have any questions or content you would like to add, please feel free to leave a comment or email me at kristin(dot)macdonough (at)gmail(dot)com. Design the ARLIS/NA NW Chapter's logo! Get our free how-to guides, suggestions & reviews that will make it easier to become an informed shopper.